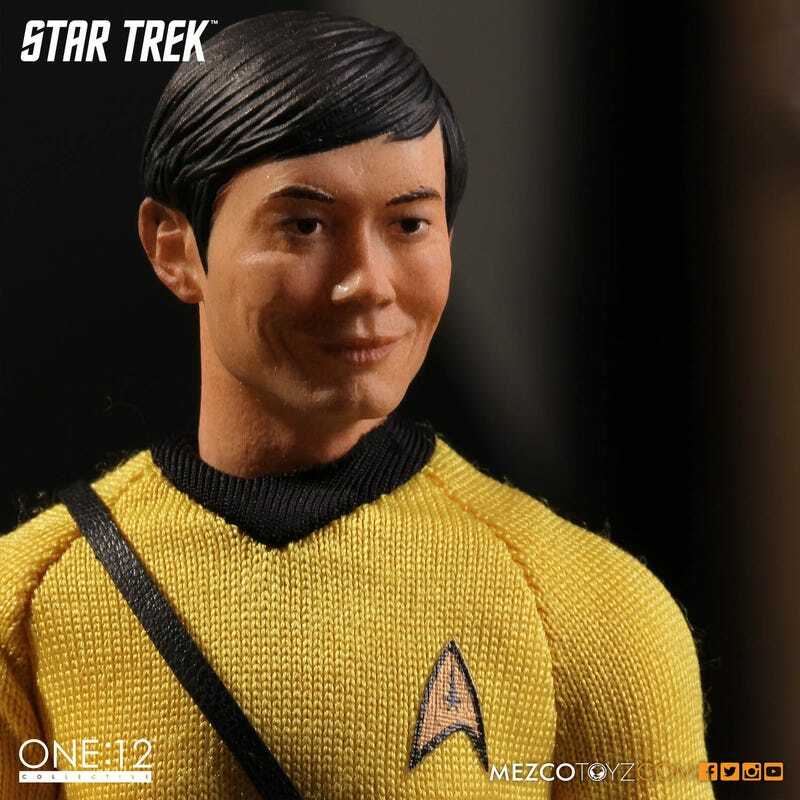 What Happened To Sulu's Face On Mezco's New Star Trek Toy? When Mezco announced they were bringing the original Star Trek to their detailed One:12 line, they did so with a jaw-droppingly brilliant figure of Spock. The next in the line, Mr. Sulu, continues so many of the amazing details that wowed us with that figure…. and then totally whiffs on the face sculpt itself. Seriously, otherwise this latest 6" figure would be absolutely remarkable, just like Spock was before it—impeccable tailoring on the clothes, something notoriously tough to do on figures two or three times the size of this, let alone on a scale a small as this. A buttload of cool little accessories, including a bevy of alternate hands, a phaser, communicator, tricorder, and even Sulu’s foil. It would be spectacular, but then you see the face sculpt. It really drags the whole thing down. It’s just way too soft to really capture George Takei at his finest on Star Trek. His defined, angular face, his thick eyebrows, his piercing eyes—none of that comes through. It’s a damn shame, because with the slightest tweaks this would be right up there with Spock and the rest of Mezco’s One:12 efforts. The alternate smiling head does an admirable job, but similarly falters. It’s probably because good emotion is difficult to capture in a static sculpt, but the softness once again just makes this look really off—so close, but not quite there. 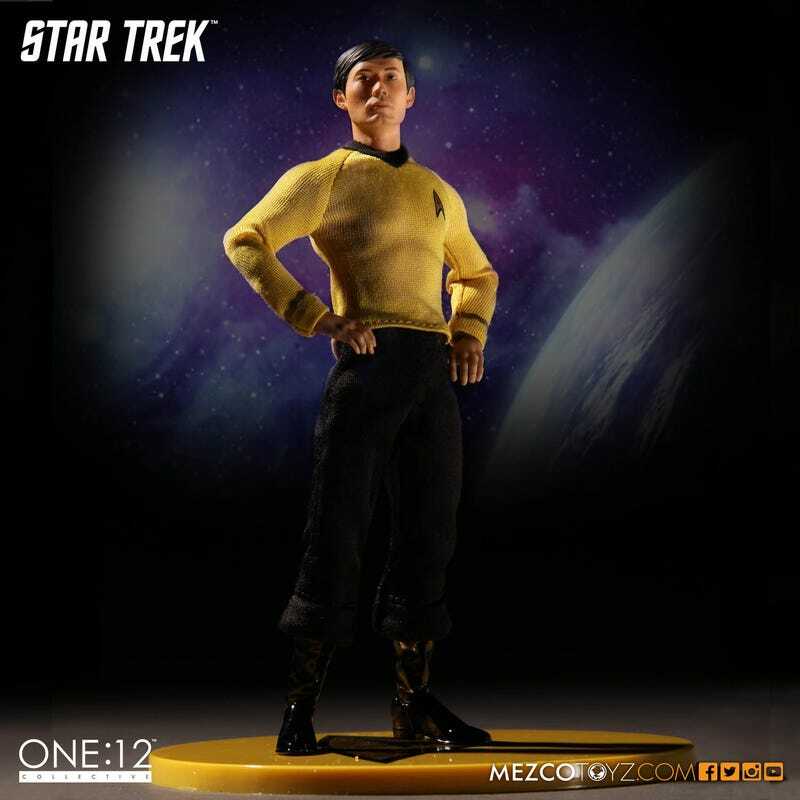 Still, if you’re so inclined—while it’s not perfect, it’s still very good indeed—Mezco’s Sulu is available to preorder on their website ahead of a June 2016 release. He’ll set you back $70/£49.